D4D are pleased to introduce the NICE META Tool to assess the value of new technologies. The META (MedTech Early Technical Assessment) Tool has been developed to help small MedTech businesses put together a robust case for adoption of their innovative product offerings. The META Tool is an online service that helps medtech developers optimise development plans for their products. It provides a framework to help identify potential gaps in development plans, and the potential next steps to bring a product to market. META is an online tool which you can use yourself, with scheduled sessions with a facilitator. D4D can facilitate META Tool use, and work with your organisation to help plan how to meet the evidence gaps identified. All information remains confidential to you, and this is reinforced with confidentiality agreements with NICE and your D4D facilitator. We can provide an objective review of available the evidence, based on years of experience of the needs of NHS commissioners and healthcare providers. The Tool includes signposting to sources of advice and expertise. There is a streamlined process to get you started with META within a day of contacting D4D. By using the META Tool you can develop an understanding of the level of evidence needed to show your product’s value to the NHS and identify any data gaps that may delay your product reaching the market. Our experience suggests that this tool can be highly valuable at any stage of a product development programme. The process is flexible but usually takes around 4 weeks. If you would like to get in touch to discuss the META Tool please contact D4D’s Commercial Director, Oliver Wells, on 07771 598644 or oliver.wells@d4dltd.co.uk. D4D were involved in testing the Tool, and we are trained as facilitators. 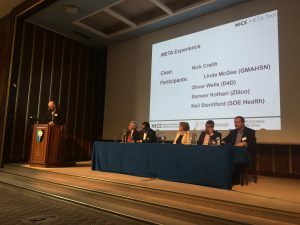 The Tool was developed by NICE in collaboration with the Greater Manchester Academic Health Science Network and Trustech.